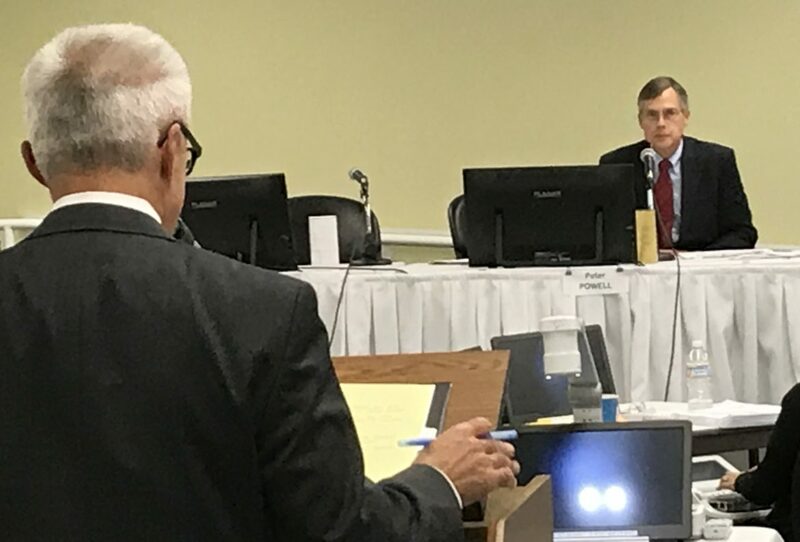 Attorney Tom Pappas, representing Counsel for the Public, questions North Country realtor Peter Powell who testified before the Site Evaluation Committee's adjudicate hearing Thursday on the Northern Pass Transmission project. CONCORD — Trying to sell property in the North Country with a view of the Northern Pass Transmission line is nearly impossible in rural areas, a long-time Lancaster Realtor told the Site Evaluation Committee on Thursday. Peter Powell, who has been a Realtor in Coos County for 43 years, said the proposed high-voltage transmission line has had a profound impact on property values in the North Country, especially for homes in rural areas. “I cannot think of anywhere in my area (that has not been) impacted in the same way across the market,” Powell said. People seeking homes in rural areas come from far afield, he said, from southern New Hampshire to Massachusetts, New York and beyond. Most are successful and able to pay far more than someone who works in the area, he said. “The have a free range to choose what they are looking for. If they cannot find something that suits them in one location, they go to another or an entirely different region,” Powell said. Powell’s testimony contradicts testimony from project developer Eversource’s expert James Chalmers who found no evidence high voltage transmission lines have a measurable affect on property values. Powell said the North Country is a unique place with a unique real estate market. “The whole experience and behavior of the market is based on a unique level of beauty and attraction,” he said, and comparing it to sale values elsewhere in the state is false at its core. Any property with a view of the Northern Pass Transmission line is affected, he told the committee, and the distance from the towers has some effect, but the real negative is the view. He said his experience is not unique as Realtors in the North Country experience the same situation. He told of several properties he has tried to sell but has been unsuccessful because of the proposed transmission line. The reduction in value is between 35 and 40 percent for homes and up to 70 percent for view lots, he said. Earlier in the day, six property owners in the North Country abutting the proposed transmission line and existing easement testified about the effect it has had on them. Sondra Brekke and her husband Bruce of Whitefield purchased a home in 2008 about 100 feet from the transmission corridor with wooden polls that will be replaced by large steel towers if Northern Pass is approved. Speaking to the committee, she said the project will have a profound impact on the couple. “From 90 percent of the windows in our house and from our land outside we are going to see towers, towers that we moved up here to get away from,” she said. Pembroke town officials are concerned that six municipal drinking water wells could be impacted by the Northern Pass Transmission project. The existing right-of-way for the $1.6 billion, 192-mile, high-voltage transmission line goes through a wellhead protection zone that borders Pembroke and Concord. Existing transmission lines are within the right-of-way, but Pembroke officials contend construction could have a significant negative impact on the water source. But attorney Adam Dumville, representing project developer Eversource, said the Department of Environmental Services had issued the necessary permits for the project to go forward and the conditions should satisfy the concerns. But Pembroke Conservation Commission Chair Amy Heiser said her concerns were still huge. Eversource had hoped to have all federal and state permits by the end of this year with construction to begin next year and the transmission line finished by the end of 2020. The Site Evaluation Committee is not expected to make a final decision on the high-voltage transmission line until the end of February. If all permits are received, project officials said earlier, construction could begin in April. Adjudicative hearings continue next week on Thursday and Friday.